So anyone who knows me knows I love a deal. So I just couldn't resist buying this faucet at ~ 60% of the price I saw in a bath store. Don't you just love it? 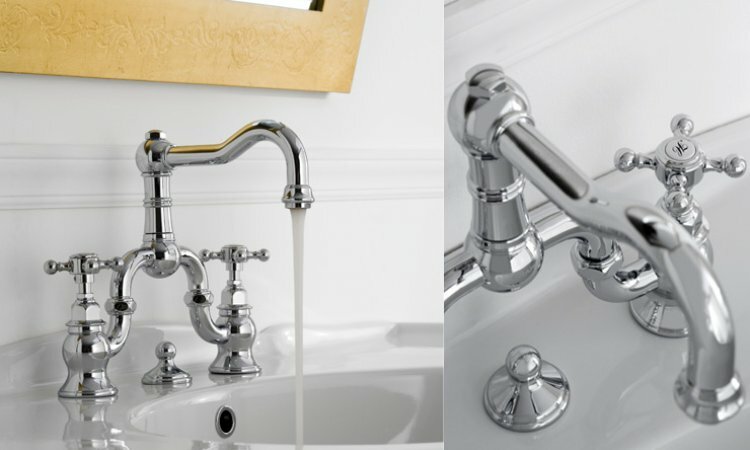 It'll take a little getting used to since I'm used to the single lever modern faucets which are so much easier but for this much beauty I can sacrifice convenience! ﻿﻿ I have Jennifer over at Rambling Renovators to thank on this one. I'd never seen a bridge faucet till I saw one in her washroom. 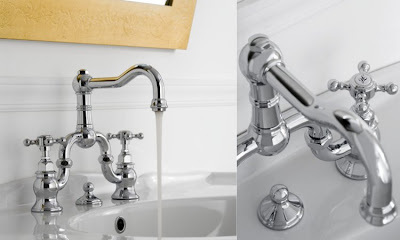 Here's her Kohler Lyntier faucet, however I regret to say its been discontinued. Bathroom Galleries in Mississaugua has one left in brushed nickel at time of writing - for anyone interested. Thanks for the shout out! Your bridge faucet sure is pretty. Lovely faucet! where did you find such a deal?